Anyway, this thread is being set up as a way to store the various family tree lists and any art Ivysaur has posted. Alongside being a chat thread. 2. Just as an added point to remain courteous. Also here is a list of rules written by our own, Eveningshadow. This shall be pmed to new members for an easier convience, as well as giving them freedom to ask questions. 3. Each post can kill or introduce up to five cats at a time. This is to prevent the entire clan from being wiped out, or overflowing the clan too much. 5. Descriptions must be semi-realistic, no purple or pink cats (unless hairless), no bones peeking out, etc. Strange names are accepted, as long as they come from a kittypet or Rogue origin. I'm going to be listing the Family Trees so far down below, so do not till I have some saves stored. I will also tag those whose tags I have once this chat is open. Start of Family Tree Post from where I mainly start. (As you can see this is cut a lot from how I normally set it, you'll see why soon. Sometime after a war that decimated AppleClan's numbers. Drizzlestorm arrives when two neighboring Clans are at war, so presumably she has another Clan’s blood, and is carrying kits of whoever her mate was. Is from Outside the Clans and joins as an apprentice. The Joining of OakClan and AppleClan occurs. 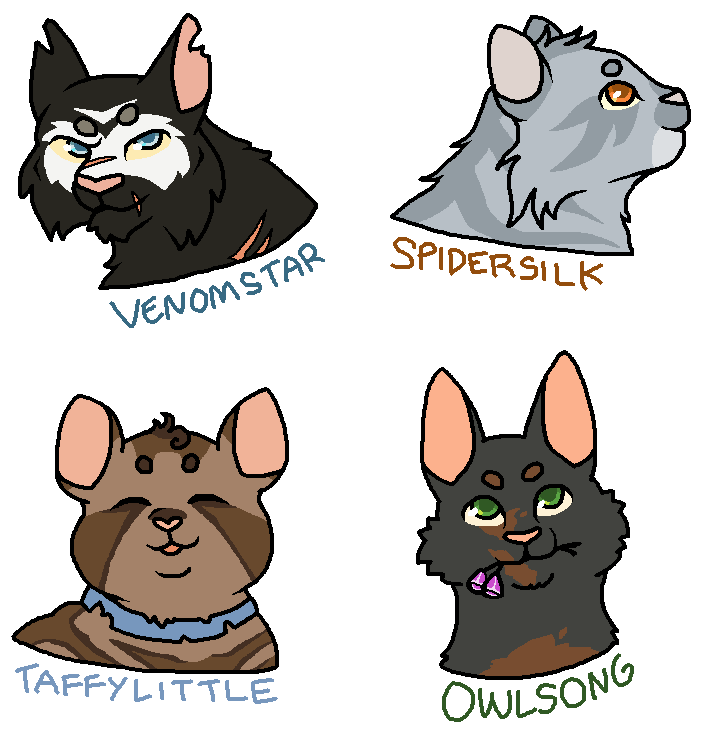 Leapstar, Hardstone, Boldeye, Grittywing, and Winkpaw are all OakClan cats. From a presumed OakClan cat. Marston is a Former kittypet that was originally a forbidden lover till he joins the Clan. Yellowscratch+Boldeye= Leafypelt, Crowtalon, Fangpaw, And Squeakheart. 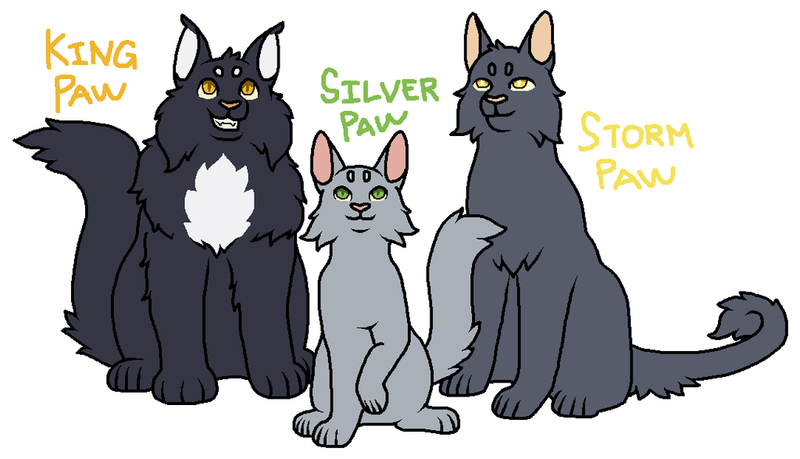 Bassfin+Unknown tom from her Clan= Alderpaw, Asterfall, Ashpoppy, who is later Ashstar, Archfoot, And Applepaw. 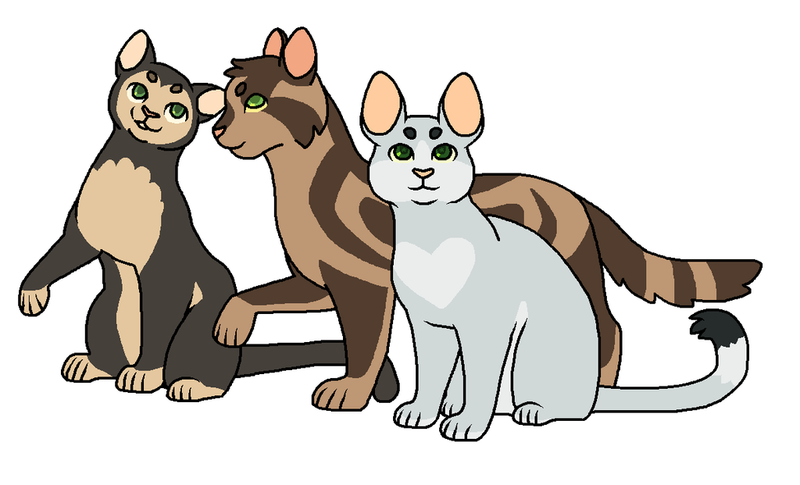 Greenfrost+Tom from her own Clan= Forestpaw, Shrewthorn, Thrushpaw, and Rootfur, who is later Rootstar. Jetheart+Glassshine= Flipshine, Henfeather, Dawndapple, Snowynight, and Nettledew. Heathersmoke+Spottedsorrel= Skypaw, Yarrowpaw, Jaypaw, and Cloudpaw. Rootspring+Swanshadow= Heartfur, Springdash who is later Springstar, and Thornpaw. 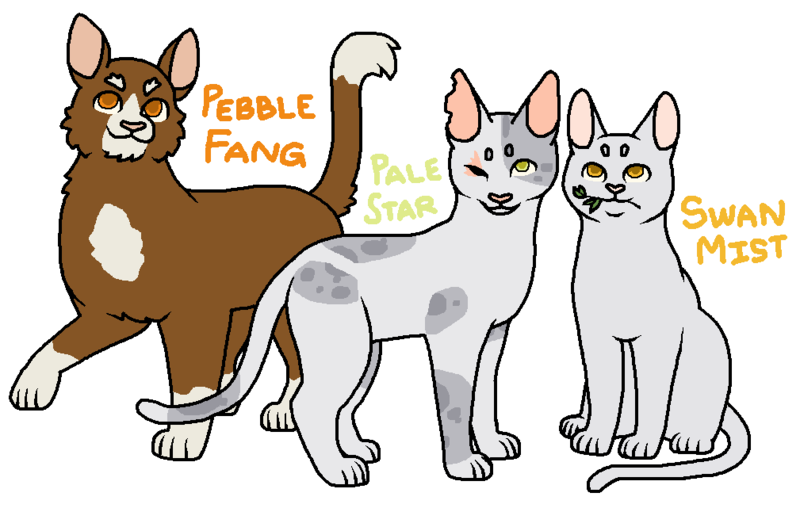 Rootstar+Swagger= Feintpaw, Growltail, Swellkit, and Rottenkit. Shatteredpetal+Unknown tom= Fallenleaf, Tansytalon, and Shadowwind. Shatteredpetal+Unknown tom= Wingflower and Dreampaw. 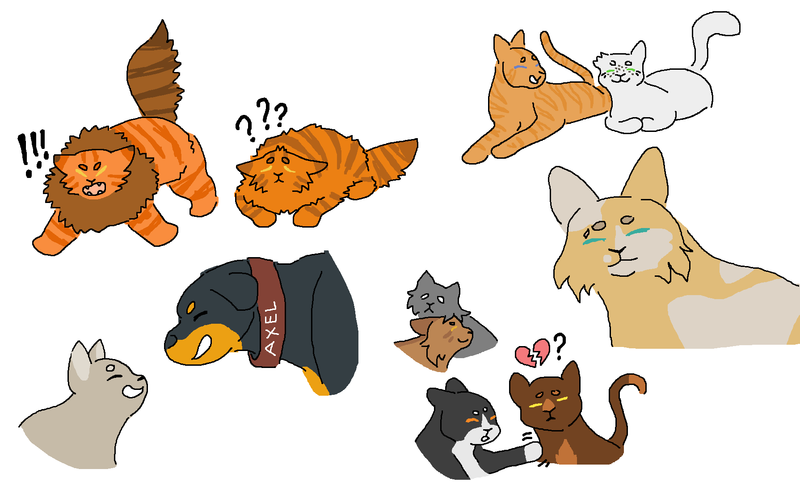 Squirrelheart+Angelwing= Fireglow, Redpelt, Crowfire, and Rowanspirit, who is later Rowanstar. Leopardleg+Fernwhistle= Unborn kits as Fernwhistle dies to greencough. Cloudshine+Iceflight= Surgelight, Applepaw, Poppypaw, and Frogpaw. ?? 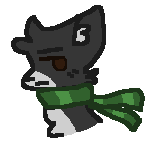 ?+Mintfur= Russetheart, Stripefoot, Rainkit, And Shiverkit. Greygrass+Needleclaw= Mossfur, Thicketfall, And Clawfern. Mudstripe+Mossfur= Squirrelheart, later known as Squirrelstar, Mooseleaf, and Halfgaze. Squirrelshadow+Brambleberry= Angelwing, most likely Goldenheart, Rowanspirit, and Smallwhisker. Sleetheart+Essie= Snowleaf, Bravekit, and Silverkit. Squirrelstar+Angelwing= Lilystem, Arcticfang, Turtlepaw, Breezefrost, and Badgerstorm. End of New Clan Territory Arc, majority of these members died before reaching the old territories, due to a rogue attack wiping out most of the Clan. Return to Old Territories- Settling In Arc. King+Specklestrike= Adderheart and Cloudmint. later Cloudstar. Also, what do you guys think of the set-up for the family tree so far? And I cannot code to save my life. Also I’m realizing how little I can do on my desktop with just editing that. I’m going to go take a shower and try to not have eyestrain and edit that mess on my phone. So I can correctly grab things and put them here and there. Also any ideas for how to establish Arc stuff so there’s not one mega spoiler post? Also tag Calamity for me. I need to be away from a screen, I feel awful. After some coding, the tree will look good. Get well soon Katana! Also, we could add the fall of oakclan and the founding of sweetclan to the arcs? Deputy, leader, and medicine cat. Palestar and Swanmist are sisters. They led during the return to the old territories. Kingpaw, later Kingflame. Stormpaw, later Stormfrost. And Silverpaw. Specklestrike and Kingflame's second litter. King was part of a group called the "Snakes" so I designed all of them to have slit pupils, which passed on to their kits. Venomstar was a rogue who became leader during a rabies outbreak. He was vaccinated which made him immune and allowed him to kill all the other infected. I believe it was Rubypond who was the main cause of the outbreak. Taffy and Spider were just random cats in the clan that time I thought would be fun to draw. Medicine cat (Tyto), deputy (Hare), and leader. Creekstar, later Creekshore, and Lakesplash out on a secret meeting. 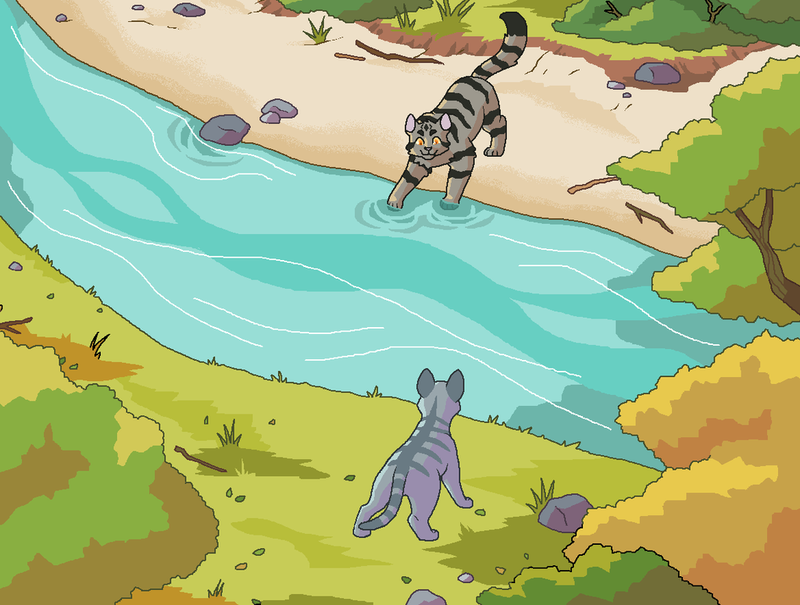 Creekstar was leader of MintClan but fell in love with Lakesplash. He later joined the clan to be with her, taking his old name Creekshore. He still kept his remaining lives which caused problems with Blackstar, the new MintClan leader. Blackstar also had a forbidden romance of her own with AppleClan's Emberspark. Emberspark later left to join MintClan, preventing a battle between the two clans. AppleClan and HollyClan have always had a violent past. Many cats have fallen in battle with HollyClan. After HollyClan attacked their camp unprovoked and killed their medicine cat and several other warriors, Cloudstar challenged their leader to a duel. Top right: Lionsnarl and Hawkswoop. Rage and fluff! Bottom left: Wrendance talking to Axel the Rottweiler! Top right: Elders Sandcliff and Lightningstreak. They are actually daughter and mother! Right: A doodle on a Tawnyowl design I had. 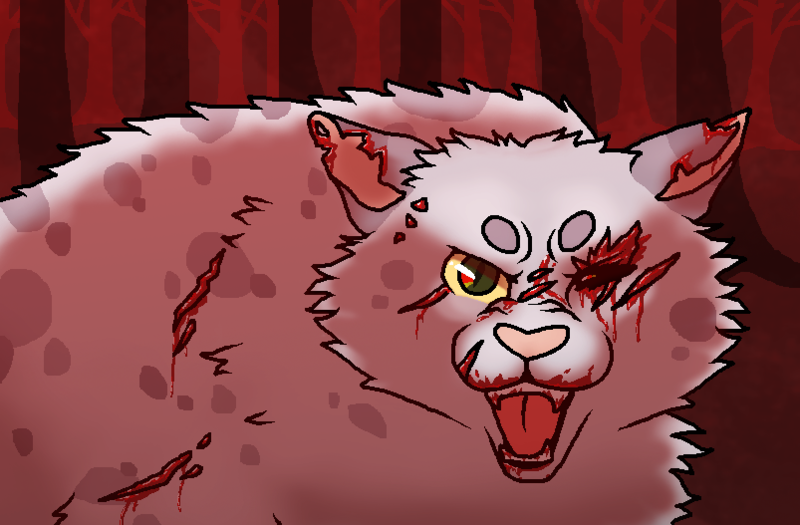 A little scar over her eye from when she was training as Lionsnarl's apprentice. Bottom right: Heartbroken Amberflame with her brother Heronsong comforting her. Her crush doesnt like her back: Juniperlight has a SweetClan mate, Wolverinestrike. But that's some really nice art you've got there, Ivy. I've seen most of it already, but it's great that now it's all in one place! I’m sorry for not being able to alert you so quickly but I was, and am; still very under the weather and couldn’t remember your tagged name. And yes, as you can see with the first post, the spoiler coding messed up several times. Oh! Aren’t you forgetting the pic of Cloudstar? Oh yeah! Whoops sorry Cloudstar Thanks for reminding me Katana! I'll add her in later when I can get to my pc. And thanks Calamity! Yeah it should be easier to remember all of them now that there in a single post!